The experience of going to camp can be an incredibly important one for children and teens with cancer. It often gives opportunities to meet others their own age who share similar experiences. Many times even children in treatment can have the opportunity to go to camp because the doctors and nurses realize how important it is for our patients. Sharon Frierdich, NP, with the Pediatric Hematology, Oncology and Bone Marrow Transplant program explains, "Camp is an important experience for children and teens with cancer. The camp experience provides a sense of freedom and independence in an environment staffed by skilled volunteers and health professionals. 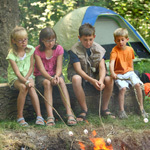 Children and teens can share their unique feelings with other campers who are "like them" and are living with cancer. The special relationships that are formed and the challenges experienced can have a lifetime impact." Kasey Davis, Health Psychologist echoes Frierdich's comments, "Camp is a nice opportunity for socialization that is filled with fun, creativity, and learning, all in a medically safe environment. It can normalize experiences and decrease feelings of social isolation by offering an atmosphere full of other kids and teens that are living with cancer. The positive memories and friendships developed will last long after the camping experience."